Plant ecophysiology is the study of a plant’s physiological response to its environment. These responses within vegetation serve to determine patterns in biogeography and community, landscape, and ecosystem ecology. The class will be a blend of lecture and hands-on learning by making measurements with a variety of equipment within existing, on-going experiments. (3) familiarize students with ecophysiological tools available to assess those plant responses. Upon completion of this seminar, students should be prepared to confidently outline and conduct ecophysiological experiments ~ including running, trouble-shooting, and maintaining commonly used equipment and interpreting measured response functions. While students anticipating plant measurements may be the especially interested, those looking to collaborate with plant ecophysiologists would also gain to learn about the tools, techniques and limitations associated with this field ~ Physical Geographers, Ecologists, Natural Resource Managers, Modelers, those studying Environmental Sciences or Environmental Studies! 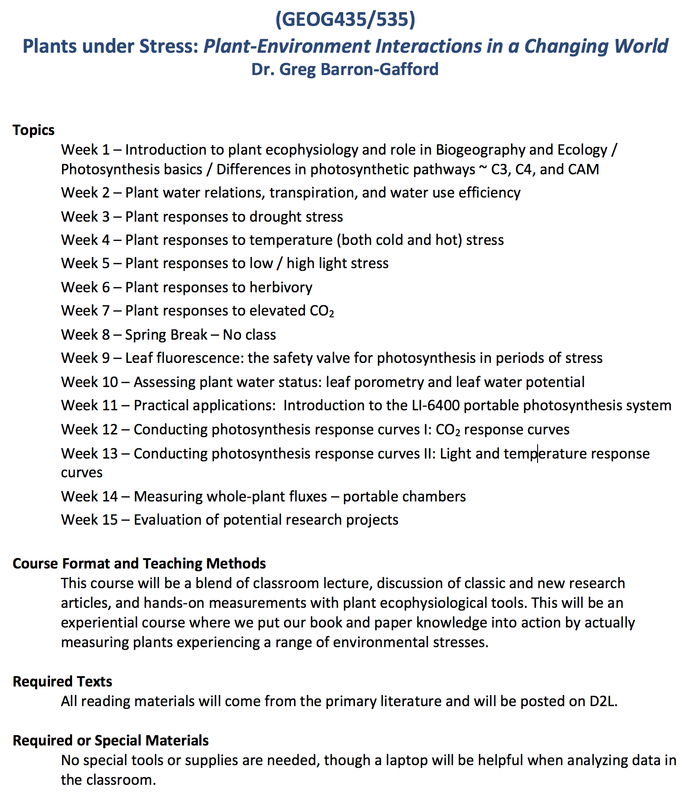 This class will also be highly relevant for those planning and creating sustainable built environments - knowing how plants respond to environmental pressures could be highly informative for intelligent design.